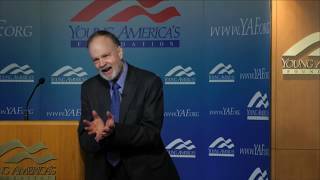 Historian Burt Folsom of Hillsdale College is the longest serving faculty member of Young America’s Foundation’s student programs, where he consistently receives top ratings from the young people he reaches at each YAF event. Dr. Folsom is a native of Lincoln, Nebraska, and he received his B.A. from Indiana University, his M.A. from the University of Nebraska, and his Ph.D. from the University of Pittsburgh. Over the last four decades, Dr. Folsom has taught U.S. history at Murray State University, Northwood University, and Hillsdale College. He was the Charles Kline Professor of History at Hillsdale College from 2003-2017. Last year he was appointed Distinguished Fellow at Hillsdale College. His two favorite courses that he taught were History of the American Presidency and History of the American Economy. Dr. Folsom has written several books. His book The Myth of the Robber Barons is now in its seventh edition and is published by Young America’s Foundation. His other books include New Deal or Raw Deal? (Simon & Schuster, 2008); FDR Goes to War (co-authored with Anita Folsom, published by Simon & Schuster, 2011); and Uncle Sam Can’t Count (HarperCollins, 2014). Dr. Folsom appears frequently as a guest on FOX News, especially with Neil Cavuto.